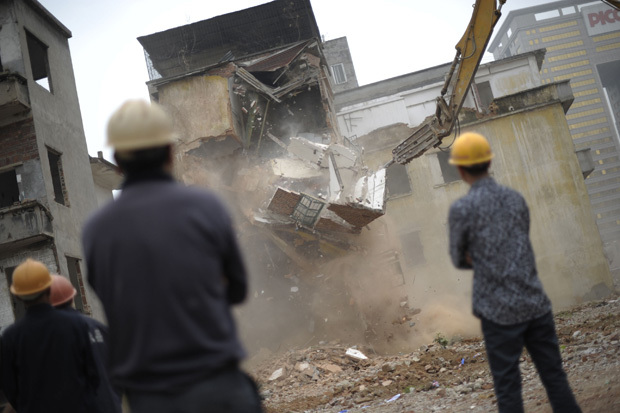 Workers on demolition orders look at a construction being taken down in Yangji village, Guangzhou, Guangdong province, March 21, 2012. Yangji, which comprised of some 1,000-plus houses, was slated for redevelopment and has been gradually demolished, making way for modern housing. It wasn’t very long ago that the Chinese blogosphere became engrossed with two near-simultaneous and very public posts by well-known expats marking their decisions to leave China for greener pastures. While grumbling about this country is nothing new, this event was notable for kicking off a flurry of media coverage internationally on the question of whether China is becoming hostile to foreigners, and when and to where disgruntled expats should hoof it. That is why this week on Sinica we are delighted to be joined by none other than Will Moss of Imagethief, whose own valedictory post earlier this week made for surprisingly sentimental reading, being not the least negative about China, and we think it’s worth talking about why. Also up for discussion: what if anything does Xi Jinping mean in his public remarks on China's coming “restoration,” and where is the best place in Beijing that we’ve found to date for azure magpie spotting.